The following information will explain the vaccination protocol I follow and may be a different point of view than you have heard before. Please also click on the pages of Puppy Vaccines to learn what I do with my puppies and ReVaccination History for more information as to why I follow the vaccine protocol that I do. I hope you will find these articles informative. I have compiled some short points to provide dog owners with an accessible, easy to read guide to safer vaccination. ask about measuring vaccination titers as an alternative to vaccinating adult or chronically ill pets. avoid vaccinations such as Lyme, Bordetella, and Leptospirosis, which have questionable safety and efficacy. give only one modified live canine parvo/distemper vaccination between the ages of 14 to 18 weeks; this can provide many years and often a lifetime of immunity In most dogs. vaccinate young puppies under 12 weeks of age. At this young age, vaccination is not usually effective because of pre-existing antibodies from the mother’s milk. vaccinate with multiple combination viral vaccinations at the same time. vaccinate at the time of hormonal, surgical or emotional stresses, including at the time of any surgery, dentistries or while boarding. vaccinate a pet who is ill with ANY symptoms, including those pets suffering from skin/ear allergies, and those with any digestive upset. Over-vaccination is not only a waste of money for animal guardians, but may jeopardize the long term health of our animal companions. Vaccine reactions are quite common, and may occur not only immediately after the shot, but over days, weeks, months or even years later in what is immunologically accepted and known as a delayed hypersensitivity reaction. Autoimmune conditions, cancers and severe neurological disease have been reported in recently vaccinated pets. Modified live parvo/distemper vaccination has been shown to cause immune system suppression 10 to 14 days after administration. Environmental shedding of modified live viral vaccine antigens may cause immune reactions in sensitive pets that have not even been vaccinated! Rabies vaccination can lead to the production of antibodies against the thyroid gland and other organs in dogs recently vaccinated for rabies. Modified live combination parvo/distemper vaccination has been demonstrated to increase allergic responses to grasses and pollens in recently vaccinated dogs. 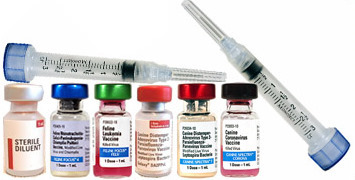 Most commercial animal vaccinations contain unhealthy levels of mercury, aluminum and other heavy metals. 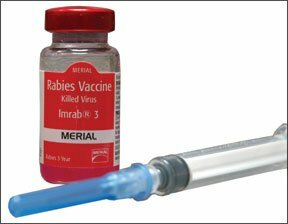 Please support the work of the Rabies Challenge Fund whose goal is to increase the duration of required rabies vaccinations to at least five or more years, as well as allow medical exemptions of dogs deemed too unhealthy to be vaccinated.